Maximum head circumference is 25"
This replica is made from brass, weighs 6.6 lb. It is 17" high, 15" wide, and 13" long. Maximum head circumference is 25". For smaller heads use appropriate amount of padding. It features forward-swept hook-like crest, with a griffon at its peak, and embossed embellishments on the dome crown. A wide shaped brim runs around the circumference of the helmet. A modular full face shield with hinged round eye opening circular mesh eye guard. Hinges with clipping closures for ease of wear. 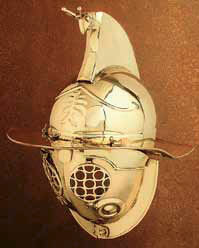 This helmet replica is similar to one of the brass helmets found in the gladiator barracks of Pompeii. One of the original helmets found is shown in the National Museum of Naples. This page was last modified on 27 September 2013, at 15:01.